Grilled Wild Salmon with preserved lemon relish is a very tasteful and delicious meal. Salmon ia a highly nutritious food. It is high in protein and good fats. This is amazing in taste lemon flavor makes it spicy and sour. Now rinse the fish carefully with cold water. Put 1-inch deep, diagonal cuts in sides of the salmon, spaced 1 1/2 to 2 inches apart. Stuff the cuts well with relish. Drizzle some lemon juice over the fish. Rub olive oil all over the fish this will make the fish non-sticky. 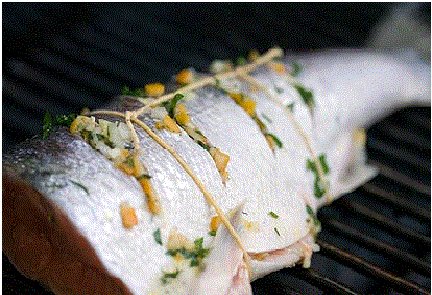 Tie up the fish with kitchen string, while grilling. When the grill is good and hot, oil the grill grates. Grill on indirect heat (away from coals or not directly over flame) for 20-30 min, turning half way. Try to keep the grill temperature at 350°F-375°F. Use a meat thermometer to test the fish, inserted into the deepest part. The fish is done when the internal temperature of the fish is 130°F. If the skin comes off when you flip the fish, or when you remove the salmon fish from the grill, don’t worry about it. Just peel it off before serving. Serve with remaining fresh relish. This salmon serve for 4.